›› Designed basic GUI for the admin control panel and tied it into wordpress. ›› Setup both the frontend code and database structure for the update queue section of the admin panel. ›› Tied frontend, database, and backend of the update queue together. ›› Put together the basic ajax scripting and the parser for the update log, effectively works without any actual updating. Notes:This is one of the more important areas of the backend admin controls, for one it allows the quick processing of updates via the click of a button, which will just send the info into the parser script which does the actual update. I still need to design a final interface for the frontend, but in many cases that will likely be tied into the design of the RPG using chimera, so for all intents and purposes, this is complete. ›› Finished the frontend script for the item shop, including the render loops. ›› Coded up the parser for the item transactions which will update the user databases. ›› Started work on redesigning dialog for the item transactions, need to speed some more time on this. Notes: There was actually a lot of work into these two items, making it work and all. This basic setup will be used with separate render loops for the techniques and various other equipment areas so it’s a pretty major section nearly finished. ›› Restructured the equipment database to make the code rendering less intrusive, linked new architecture to existing update script. ›› Added new Dialog to allow the transfer of equipment to another player, same as with items. ›› Added new box in inventory to show what unequipped equipment you currently own, not finished. ›› Restructured the equipment database one last time, architecture from this point on should be set and not change. ›› Added checks to equipment transfer to unequip when sending something you had equipped. ›› Designed and implemented a dialog to allow transfer of items to other players, no script to actually do it yet. ›› New conceptual idea worked on to add a small ‘card’ of sorts to the nav area of the profile page with brief space ship info. ›› Scripting to manage transfer of items written, debugged it as well shouldn’t need any more work here. Notes: I’ve figured out a pretty good way of handling items and equipment, I came to it after developing the equipment database setup yesterday though so I need to go back and change that around a little to make transfer of equipment easy. That being said Equipment and Items with each have a unique transfer script though the dialogs will be pretty much the same. Hopefully I can finish the item transfer stuff today, which will put things pretty close to being finished with the profile section. Then I will move on to the registration script which I’ve spoken about before. Squaring up these item/equipment areas will also allow development of the item shop script. ›› Filled the jjequip database with some sample equipment. ›› Created new database called jjedata which holds all information about each piece of equipment including info for rendering them. ›› Started work on the frontend scripting for the equipment section of the profile. ›› Setup the sequencing chain to load drop down selections for what equipment you own in the equipment dialog, debugged checks. ›› Started planning for the parsing script which will allow you to actually swap said equipment on the fly. ›› Parsing script for the equipment swapping finished. ›› AJAX sequence to re-render both equipment box and stats box after a change in equipment finished. ›› Designed and implemented new dialog to transfer woolong. ›› Created simple script to perform checks and then update both profiles after woolong transfer. ›› Setup unique database & render engine for techniques. ›› Setup unique database & render engine for items, more work to be done here. Notes: I’ve been away from the engine for six months now, I didn’t plan for that to happen I just kinda lost interest in coding all the time and JJ in a whole. Back on track now, hoping to have all the initial profile stuff done here shortly, the equipment stuff is the most complicated of what’s left so once that’s settled techniques and items should be quick and which point development will shift from the profile part of the engine to developing a render engines for the item/equipment shop and a registration form to actually make a profile. More work today effectively finished the equipment section of the engine. Last note of the day, all that’s left of the profile form is to make a script and dialog that lets you give items/equipment. ›› Created the jjequip database, where all user equipment will be tracked for the profile. ›› Did some minor scripting to allow the player stats to render and show + or – changes when equipment is swapped. ›› Got the equipment dialog designed, ready to start the scripting for it with some demo equipment. ›› Started pre-designing the registration form, pretty much organized, just need to write it up one day. ›› Got the current demo hosted here on the Chimera Engine page demo userid so anyone can play around with it. Notes: With the dialog done and the database ready I can start working on the code that will allow swapping of equipment. This is going to be more challenging than the previous scripts since it has to not only retrieve data and allow real time updates of data but also parse the data to render stat changes. This is going to be the toughest part of the Chimera Engine code, once this is done most of the other work will be easy to complete, only requiring time to write it, as much of the design work on how it will function has been completed. 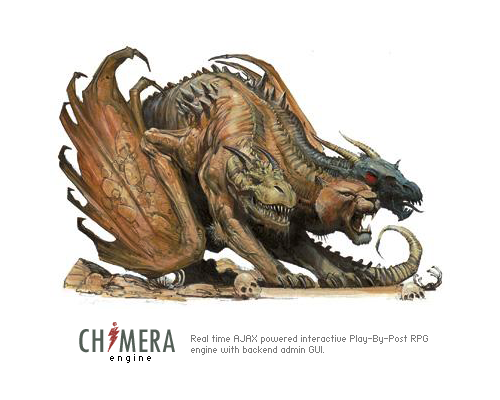 ›› Nearly finished the Chimera Engine project page, which you are looking at now. ›› Did some minor updates to the actual wordpress install to allow further Chimera Engine work. ›› Started putting Demo version of Jupiter Jazz profile page together. Notes: Work on DystopiaPro has kept me from getting Engine stuff done, however that work is now nearly complete and I have the engine’s homepage up now as a place to keep track of my work, so progress will ensue in the next day or so. ›› Finished dialog design for the ‘Character Information’ tool, connected everything to the profile database. ›› Wrote and inserted the AJAX code to update the character information part of the profile, created PHP script to handle update. ›› Started conceptual design for the equipment dialog and database structure, lots of work to do here. Notes: Still plenty of cleanup work to do on the code, also it’s nearing time to add the user tier structure and create the sign-up page. ›› Cleaned up image resizing code, works better now though there is still a window between 280px and 340px that it will be wonky. ›› Dialog design for ‘Character Information’ editing started, mostly done. Need to define AJAX properties and connect the tools. Notes: Still more work to do on image resizing, need to complete Character Information dialog and tools. ›› Initial AJAX code written, placed into page and synced with Jupiter Jazz profile database. ›› Dialog and tools for ‘Profile Image’ changing designed & implemented into Jupiter Jazz profile page. ›› Dialog and tools for ‘Character Biography’ editing designed and implemented into Jupiter Jazz profile page. ›› Initial scripting to resize profile images written, needs work. Notes: More work needs to be done on automatic image resizing, it doesn’t always work.